I’m hoping I will get to see my beautiful sister and her new baby girl over the Christmas holidays. If so, I’ll have this sweet little burp cloth ready just for her. For anyone who is new to machine embroidery, let me take a moment to say that any embroidery machine with a hoop size of 4×4 or larger can do this project. 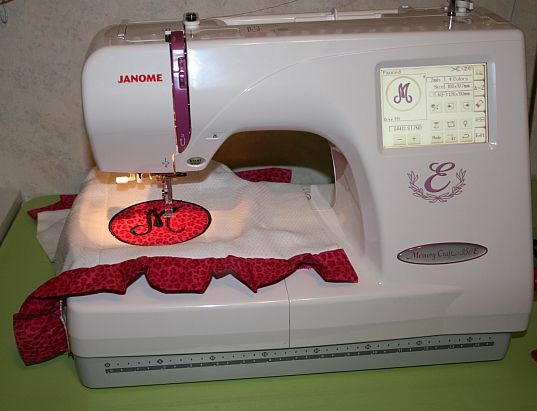 You will need: your sewing machine, your embroidery machine, some fabric, self -adhesive tear-away stabilizer, embroidery thread, regular sewing thread, a burp cloth, and an embroidery design that you want to put on the burp cloth. 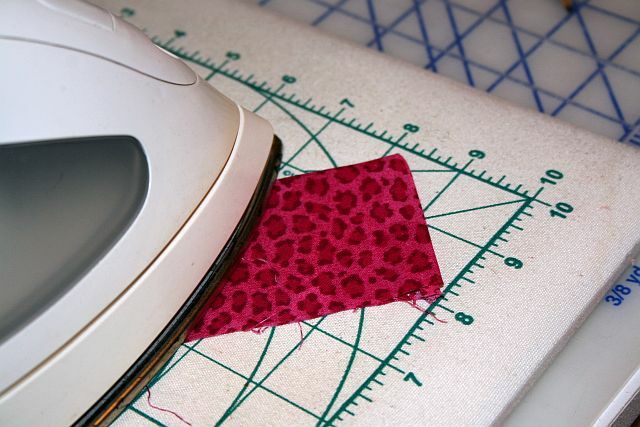 I chose to do an applique, so you’ll get to see how that works if you read this tutorial. By the way, feel free to post any questions you have about projects of all kinds. I’ll do my best to answer you in short order! #1 Making Ruffles: Cut 2 strips of fabric, 20"x5". 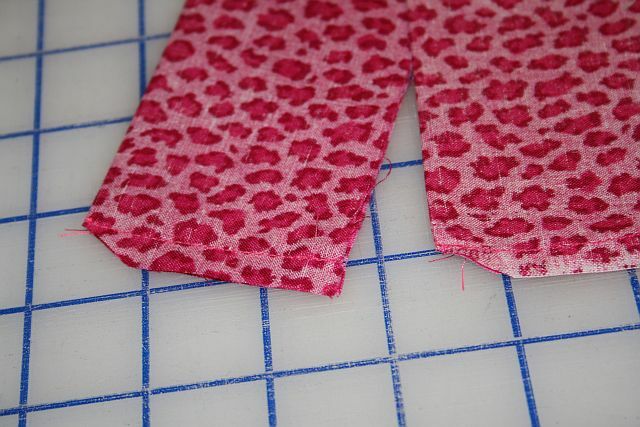 Fold one of them with right sides together lengthwise and stitch a 1/2" seam along the short ends. Clip the corners. Repeat for the other strip. #2 Turn the long strips of fabric right side out and press. 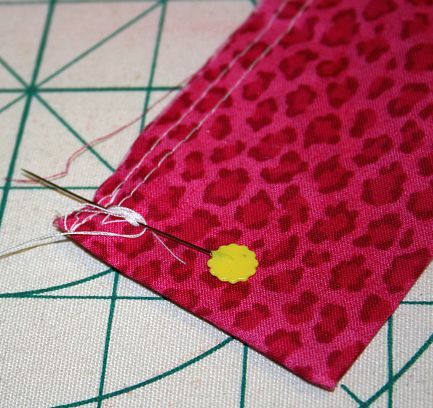 #3 Set your machine for a 4mm stitch length to baste 2 parallel lines next to the long raw edge of your fabric strip. 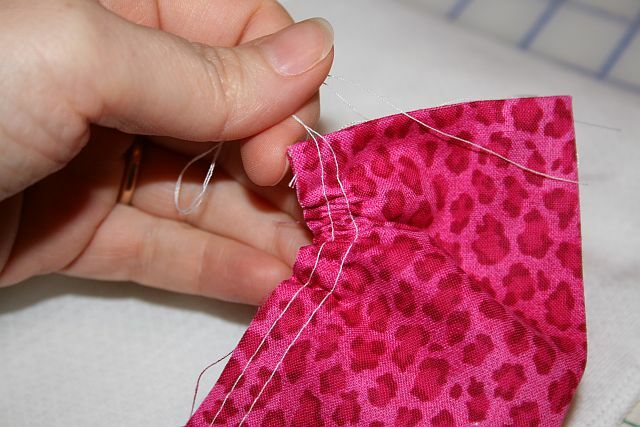 Leave long thread tails at both ends of the strip. #4 Anchor one end of the thread tails by winding them around a pin in a figure 8. #5 Pick up the 2 thread tails on the front of your fabric strip and pull the threads to gather. Ease in the fullness of the ruffle to match the width of your burp cloth. 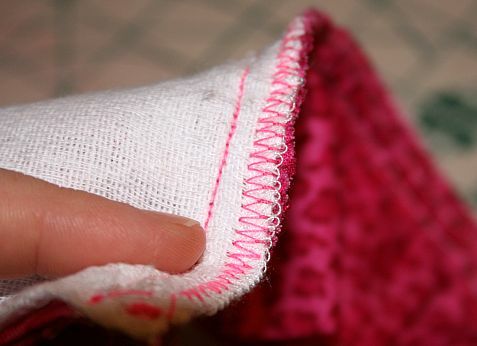 #6 Pin ruffle to bottom edge of burp cloth, adjusting gathers as needed. 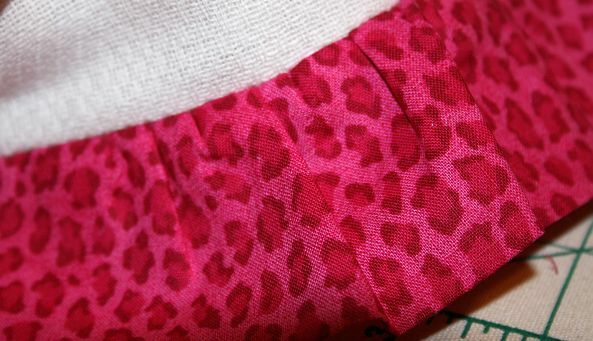 #7 Stitch a 1/2" seam along the raw edge of the ruffle. 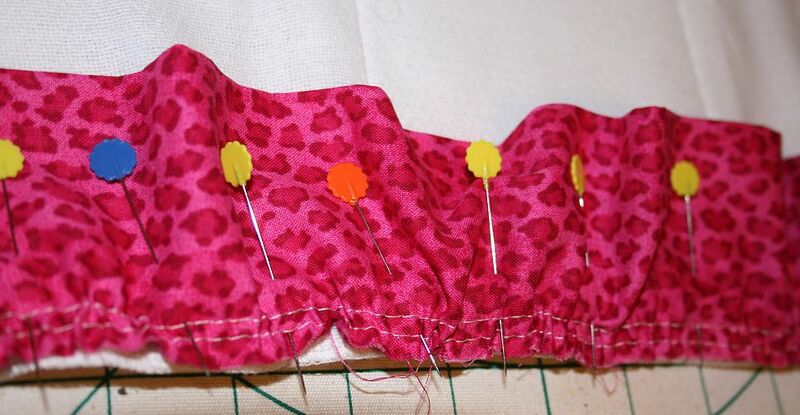 Remove pins as you go. 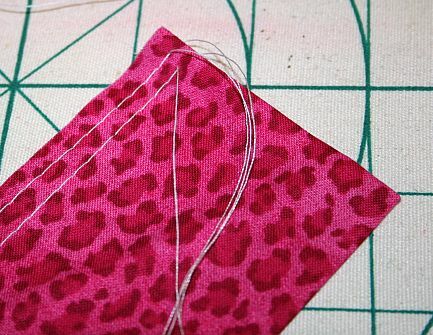 Then, zig zag the raw edge to prevent unraveling. #8 Press your ruffle away from the burp cloth. Repeat steps 3-8 for the other strip of fabric at the other end of your burp cloth. First, find and mark center front of the burp cloth. 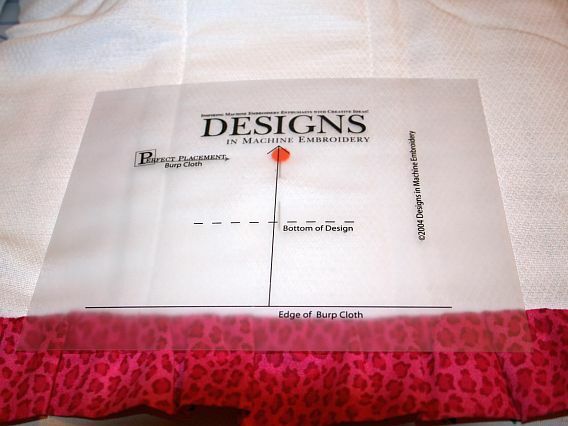 Decide where you want the design. I used a placement template from The Perfect Placement Kit. It's an easy way to get things just where you want them. 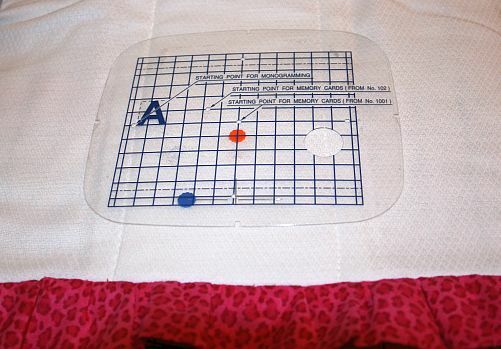 Once you know where you want the design to end up, you can use the grid template that came with your machine to help you with centering your project in the hoop. I hooped a piece of self-adhesive, tear-away stabilizer and laid the burp cloth on top of it, placing as needed. 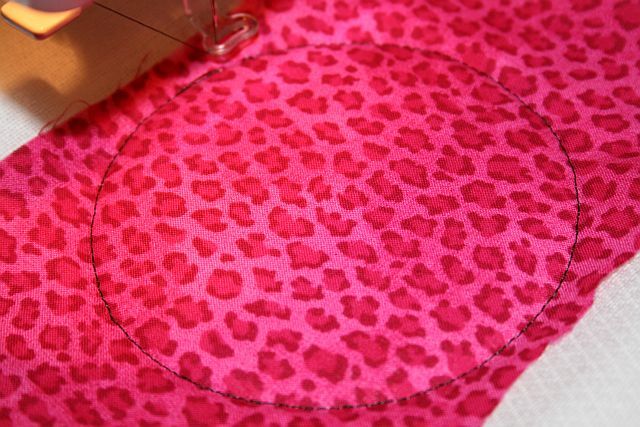 Then, I stitched the outline of the circle applique with my embroidery machine. Next, I laid a piece of fabric on top of the circle outline that I had just stitched and my embroidery machine stitched the circle again. 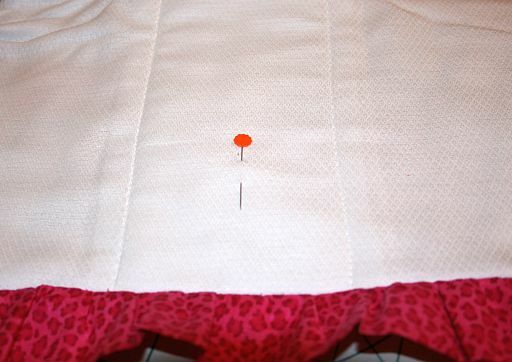 This step tacks down my applique fabric. 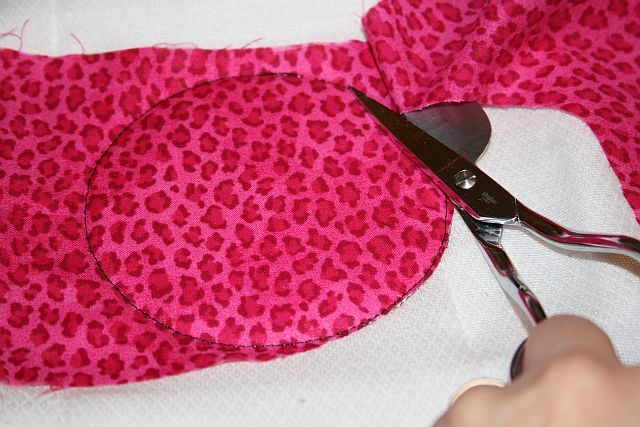 Then I used my applique scissors to trim away the excess fabric around the circle. I was careful not to cut the burp cloth. Lastly, I snapped the hoop back onto my Janome 350E and finished the satin stitch around the circle and stitched the monogram onto the fabric. I hope my sister likes it! The baby's name is Mikaelah. This is a font that comes with Monogram Works. LOVE IT!!! Well, that’s all for now. 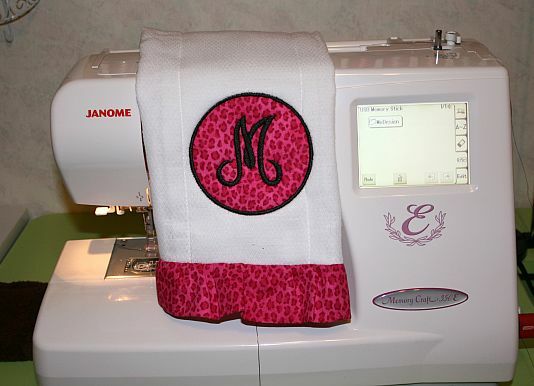 Except that since you hung in there and read the whole post, I’ll show you a picture of the 2nd thing I made with my new software…..
A monogrammed towel for my mommy! This font also comes with Monogram Works.... I hope she likes this! If you haven’t signed up to follow us via email yet, go ahead and do it! This way you will be the first to know when we launch our next gift give-aways and contests! 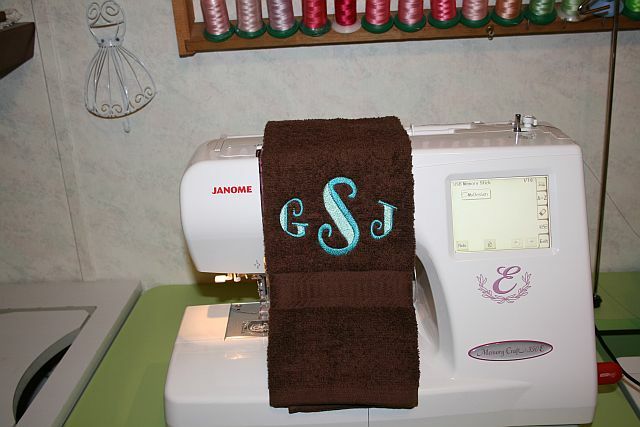 This entry was posted in Featured Machines & Cabinets, Machine Embroidery FYI, Make for Baby, Project Tutorials, Sewing FYI and tagged applique tutorial, burp cloth tutorial, embroidery software, Monogram Works, sewing ruffles on December 23, 2011 by Jenny Gabriel. That is a good tutorial for someone like me who doesn’t know how much the machine is capable of! Thanks! I am loving your blog posts! You are certainly an asset to Brad in my opinion! Clear instructions, joyfully written, eye catching fabrics, fantastic, easy adjustments/embellishments to patterns…professional & fun! Keep it up! Thanks for your encouraging words, Janetta! I’m loving my new adventures in blogging! Pretty section of content. I simply stumbled upon your site and in accession capital to assert that I acquire actually enjoyed account your blog posts. Anyway I will be subscribing to your augment and even I success you get right of entry to consistently fast. I’m new to the embroidery world and my brother is having a baby so I’m trying to make a burp cloth for him. Do you just leave the stabilizer on the back of the cloth?? Also, what software did you wind up getting? I’m so lost as to what software I should get for different fonts etc. Thanks for this tut. its very informative. thank you so much for posting this photo tutorial. Very nice! You gave me an idea. 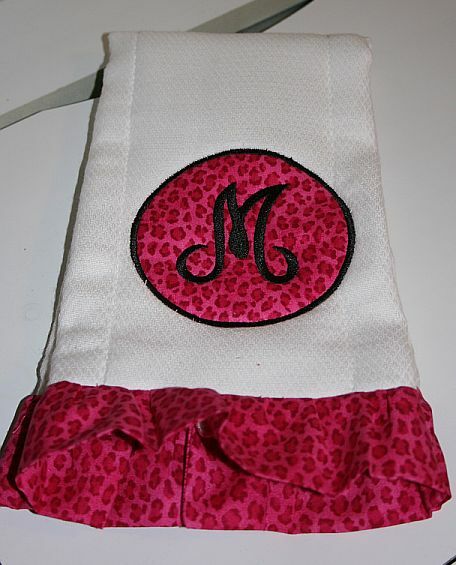 I was just going to band fabric at the bottom of a diaper burp, but ruffles are definitely better…it’s a girl..Thanks! friend insist upon it, I don’t know anything about the game). in your neighborhood mall and find all the gear you want. I just stumbled upon your tutorial. I have same machine and don’t know how to do much with it. 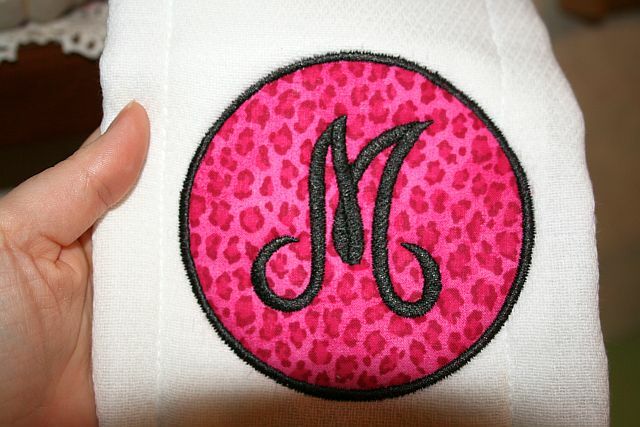 I want to make boy burp cloth with initial W in a frame embroidery only. No appliqué. I don’t have software. Don’t know what to buy. Would rather just buy framed initial in 3″ size. Do you have suggestions. I’m not tech savvy and no time to learn. Thanks. 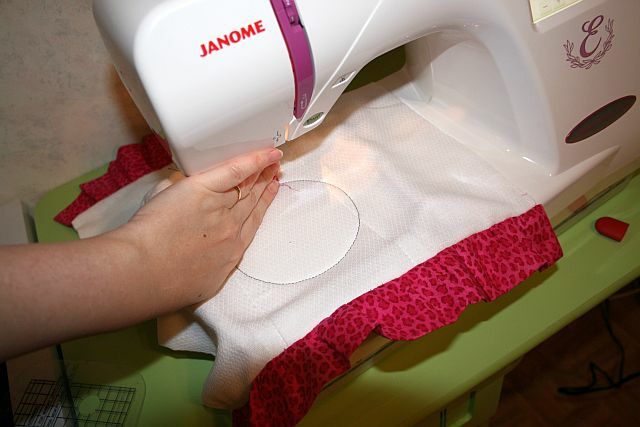 Looking for more things to do with my Janome.